In contrast to the Roman Catholic Church, where interpretation of scripture is carried out by the Pope and his Bishops, Protestantism encourages ‘Private Interpretation’ of scripture by the individual. As a direct result, differing denominational groups have emerged, each holding to distinctive doctrines. Each regards itself as part of the ‘Invisible Church’ i.e. the union of believers on earth and in heaven, known only to God. There are also growing numbers of non-denominational churches. This term, while implying non-alignment with a specific (Protestant) denomination is also usually understood to mean a church in agreement with the Five Solae of Protestantism. An example are the Vineyard group of Churches. These churches emerged during the reformation era, particularly in Switzerland and The Netherlands. A group of individual reformers disagreed with the baptism of infants as practiced by the Swiss reformer Ulrich Zwingli (see the section ‘The Reformers’) for more information. This group of individuals was known as Anabaptists (literally: ‘rebaptisers’), as they emphasised adult baptism. The Anglican churches comprise those that follow the established customs and practices of the Church of England. In some countries (especially the USA), they are known as Episcopal churches, from the Greek episcopos : ‘Bishop’. There are an estimated 70 million Anglicans worldwide. All Anglican churches regard the church of England as the mother church and the Archbishop of Canterbury as the symbolic head. However, the Archbishop does not exert any controlling influence outside of England: his is a primacy of honour and not of jurisdiction. The first Baptist church was founded in Amsterdam in 1609 by John Smyth (c. 1554-1612). Baptist churches are distinctive in that they emphasise Baptism on confession of faith (called Believer’s Baptism), and also by full immersion in water, rather than sprinkling. Infants are not baptised but ‘dedicated’ to Christ in a ceremony. Once the child is old enough to profess faith clearly, they may then be baptised into full membership of the church. There are over 40 million Baptists worldwide, including over 30 million in the United States. Congregational churches are those that emphasise the autonomy of each individual church in governing its affairs. Robert Browne (1540-1630) founded the first church based on congregational principles in 1582, after dissatisfaction with the Church of England. This desire for complete separation from the Church of England led some congregationalists to leave England as part of the Pilgrim Fathers who sailed for the USA in 1620. The Lutheran churches define themselves in the Augsburg Confession of 1530 as “The assembly of believers among which the Gospel is preached and the Holy Sacraments are administered according to the Gospel.” There are estimated to be over 80 million Lutherans worldwide, with significant numbers in Germany, Scandinavia (Denmark, Sweden etc.) and the USA. The story of the Methodist church really begins with the Wesley family: John Wesley (1703-1791) and Charles Wesley (1707-1788) were born in the village of Epworth in Lincolnshire. Their parents were Samuel and Susannah Wesley. Samuel was a Anglican rector and Susannah was a remarkable woman, known to spend much time in prayer for her family. In 1709, there was a serious fire at the rectory and John Wesley nearly perished. His Mother believed he had been rescued for a special purpose – a “brand plucked from the burning”. As their name implies, the Pentecostal churches lay particular emphasis on the gifts of the Holy Spirit (Greek: Charismata) as manifested in the life of the individual. The roots of Pentecostalism lie in the “holiness” movement as form of empowerment for the Christian through the Holy Spirit, which for example was developed by John Wesley in Methodism. The founder of the Quakers was George Fox (1624-1691). Although born into a Anglican household, Fox developed his own form of distinctive Christian teaching, developing the idea of the “Inner Light” – a sense of God’s presence which could be cultivated, often through periods of silence. Fox called it “Christ Within”. The Reformed churches generally hold to those ideas held by Ulrich Zwingli and (especially) John Calvin. In contrast to the Lutheran doctrine of electing a hierarchy of bishops (Greek: Episcopoi ) to govern the church, Reformed churches usually elect elders (Greek: Presbyteroi ) to carry out this function. The elders work together as a group but are accountable to higher groups known as presbyteries, synods or assemblies. 1. “Reformed” in this context includes churches who adhere to a Presbyterian (synodical) form of church polity (governance). Some Reformed churches adhere to Congregational polity and these are listed separately. 2. 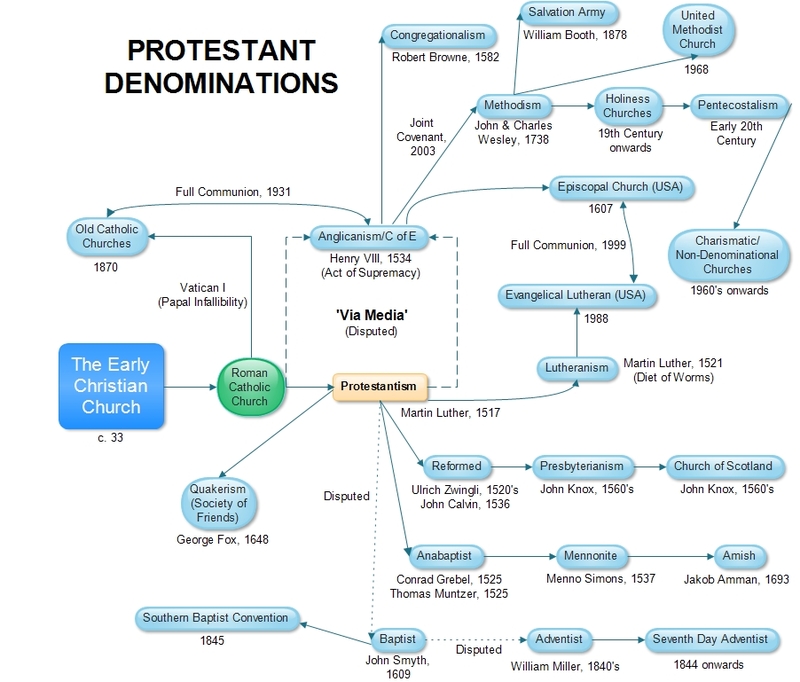 The position of the Anglican church as a Protestant denomination is disputed, with some viewing it as a via media or “middle way” between the Catholic and Protestant traditions. 3. The Baptist denominations are generally considered to lie within Protestantism, though some argue that the practice of “believers baptism” i.e Baptism on confession of faith by the candidate preceeds the Reformation and therefore Baptist churches should not be grouped in this manner. 4. William Miller (1782-1849), a Baptist preacher began in the 1840’s a movement known as Adventism, which emphasised the second coming or “advent” of Jesus Christ. Miller originally predicted the return of Christ in 1844, the failure of which became known as the Great Disappointment. Several groups arose out of the Millerite movement, the largest of which is known as the Seventh Day Adventists, who regard Saturday as the correct day of the Sabbath. Their position within mainstream Protestant Christianity is disputed. Menno Simons (1496-1561), eventually emerged as leader of the movement. Persecution led many followers to flee to the USA and Canada, where they flourish to this day. There are around 1 million Mennonites worldwide and many of them follow the Dordrecht Confession of 1632. A Swiss bishop named Jakob Amman (1656-1730) led a movement for reform within the church. A resulting schism resulted in the formation of a new group of Mennonites, who came to be known as Amish. Many Amish emigrated to the USA and survive today in tightly knit communities. They are known for their rejection of modern lifestyles and reject the use of cars, electricity and other modern conveniencies. Like many Mennonites, they are a strongly peace loving people, rejecting all forms of violence. Other Anabaptist groups include the Hutterites, named after Jakob Hutter (c. 1500-1536). They are a much smaller group who today reside mainly in North America. The history of Anglicanism as a separate denomination really began with the decision of Henry VIII (1491-1547) to overthrow the authority of the Roman Catholic church in England. This followed the refusal of Pope Clement VII (1478-1534) to grant authority for Henry to divorce his then wife, Catherine of Aragon (1485-1536). Henry carried through his demands by passing the Act of Supremacy in 1534, making him “…the only Supreme Head in Earth of the Church of England.” The church of England remains as the official state church to this day, with the monarch as the head. Ironically in 1521, Henry VIII had written the article Assertio Septem Sacramentorum (Latin: ‘Defence of the seven Sacraments’), in response to the teachings of Martin Luther. Pope Leo X (1474-1531) rewarded Henry with the title Fidei Defensor (Latin: ‘Defender of the Faith’), a title which appears on all British coins as ‘F.D.’ to this day. The architect of Anglicanism was Thomas Cranmer (1489-1556), Archbishop of Canterbury under Henry VIII. Cranmer drew up the Book of Common Prayer in 1559 (later revised in 1662). In 1571 the 39 Articles were written, giving a clear exposition of Anglican theology in response to that of the Roman Catholic church. Protestant – for example, the church rejects the universal authority of the Pope. From the 1830’s onwards, a desire grew amongst some Anglican clergy for greater expression of the Catholic portions of their faith. For example, the use of liturgical vestments, incense and prayerful devotion to Mary was encouraged. This was known as the Oxford Movement, so called because many of its leaders were based there. Chief amongst them was John Henry Newman (1801-1890), who famously wrote a series of articles (known as the Tracts for the times ), outlining the view of the Church of England as the via media. In Tract 90, published in 1841, Newman attempted to show that the 39 articles were not incompatible with Catholic belief and the misunderstandings of Catholic doctrine in the articles could be resolved. This led to a dispute and the Bishop of Oxford decided to forbid any further publication of the tracts. The negative response to Newman’s work played a large part in his decision to join the Catholic church. Eventually Newman became a Cardinal and continued to write theological works, including his theory of the Development of Doctrine, explaining how Catholic belief has developed over the centuries. The Oxford movement continues to this day in the form of Anglo-Catholicism or what might be called a High church position, in contrast to other Anglicans who favour a more Protestant theology (Low church). A mixture of these views coexists within the church. As an example, some accept the seven Roman Catholic sacraments of Baptism, Eucharist, Confirmation, Anointing of the sick, Penance, Marriage and Holy orders, whereas others hold to only the first two, in common with traditional Protestantism. The Bishops of the Anglican communion meet every ten years for what are known as the Lambeth Conferences, as the Archbishop of Canterbury’s residence is in Lambeth Palace, London. The first such conference was held in 1867. 1. The Holy Scriptures of the Old and New Testaments, as “containing all things necessary to salvation,” and as being the rule and ultimate standard of faith. 2. The Apostles’ Creed, as the Baptismal Symbol; and the Nicene Creed, as the sufficient statement of the Christian faith. 3. The two Sacraments ordained by Christ Himself – Baptism and the Supper of the Lord – ministered with unfailing use of Christ’s Words of Institution, and of the elements ordained by Him. The Anglican church has been active in the ecumenical movement, especially in its relations with the Roman Catholic church. Following a historic meeting in 1965 between the Archbishop of Canterbury and the Pope, the ARCIC (Anglican Roman Catholic International Commission) was set up to undertake theological dialogue between the two churches. Most Baptist congregations are totally independent of each other, but may be associated in organisations such as the Southern Baptist Convention in the USA. Each congregation has total autonomy in matters of church doctrine and discipline and church meetings are held on a regular basis to deal with these issues. This independence has led to differing views on such issues as Calvinism/Arminianism (see the entry Reformed and Presbyterian churches for more on this), and female ordination. Baptists practice two sacraments (also known as Ordinances ): Baptism and Communion. Their view of Communion is known as Memorialism : The bread and wine are only symbols of Christ’s body and blood. Organisationally, Baptist churches are led by a Pastor (Latin: ‘Shepherd’), who is assisted by deacons in ministry. One of the most famous Baptists of the 20th century was Martin Luther King (1929-1968), the great American civil rights leader. In 1972, many Congregationalist churches in England and Wales merged with the Presbyterian Church in England, forming the United Reformed Church. Following Martin Luther’s break with the Roman Catholic Church, the doctrines of Sola Scriptura and salvation by grace through faith alone became key tenets of his belief system. Lutheranism affirms that there are two Sacraments of Baptism and Holy Communion (The Eucharist). Regarding the Eucharist, Lutheran belief is that Christ is truly present in the bread and the wine. This mode of presence is in, with and under the elements. This is known as Consubstantiation, in contrast to the Roman Catholic doctrine of Transubstantiation, which affirms that the bread and wine change completely into Christ’s body and blood. Luther himself explained this by using an analogy of an iron rod placed into a fire: both are united in the red-hot iron, yet both are also distinct. In the 17th century in Germany, a movement within Lutheranism developed, emphasising individual conversion, detailed study of the bible and a more active role for the laity in the government of the church. Pietist ideas did not meet with universal support, but in later times they were to exert a significant influence on John Wesley and the Methodist movement. One of the most famous Lutherans of recent times was Dietrich Bonhoffer (1906-1945), a German pastor, who died as a marytr during World War II. In 2006, this declaration was also approved by the World Methodist Council. In the 1720’s, the Wesley brothers founded a fellowship at Oxford University. Here people could commit themselves to prayer and bible study. The group soon attracted the attention of other students, not all of whom were in favour of this new way of worshiping God. Various labels for the fellowship were given, including “Holy Club”, but it was the term “Methodist” that stuck. His brother had also undergone a similar experience at around the same time. The stage was now set for both brothers to bring the good news to the masses. On 11 June 1738 in Oxford, John proclaimed “The whole world is my parish”, and Charles and himself set about preaching and teaching. What was distinctive was their method – open-air meetings designed to attract many people, irrespective of class. John Wesley may have travelled over 250,000 miles and preached over 40,000 sermons during his lifetime – a remarkable achievement. As Methodism grew as a movement within the Church of England, it became necessary to look at ways in which it might be governed. John Wesley favoured the “Connexional”, which meant that local churches were organised into circuits, so that preachers could travel from one church to another. Circuit plans were drawn up for each minister and this system continues to the present day. Each circuit makes up a district and representatives from each district attend an annual conference. In 1784, John Wesley encouraged the development of Methodism in the USA and beyond. Today, Methodist churches are found around the globe. Church membership in the UK is about 250,000 and about 70 million people worldwide have some form of link with the Methodist church (source: Methodist web site). Charles Wesley, as well as being a preacher, gave Methodism a wonderful legacy in his hymn writing. He wrote about 5,000 hymns during his lifetime including “Hark, the herald angels sing” and “Love divine, all loves excelling”. In 1795 the Methodist movement seceded from the Church of England and became a separate Protestant denomination. However, the two groups have always had strong links, and in 2003 a joint covenant was signed to explore ways of working together. The Basic theology of Methodism is known as Arminianism (after Jacob Arminius (1560-1609), who questioned some of the doctrines held by John Calvin). Arminianism emphasises the free will of individuals to follow or reject Christ and the possibility of one losing their salvation. This was a reaction to Calvin’s doctrine of predestination, by which God determines an individual’s final destiny, whether it be to eternal life or damnation. Arminianism rejects all of the Five points of Calvinism * (with the exception of Total Depravity). The exception to the Arminian view is held by Methodists in Wales, who tend to be more Calvinistic in doctrine. In common with many Protestants, Methodists hold to two sacraments: Baptism and Holy Communion (The Lord’s Supper). * The five points are explained further in the “Reformed” section. Wesley also taught the doctrine of Holiness, sometimes also known as entire sanctification or a “second work of grace”. The idea is a form of Christian perfection, occuring sometime after conversion and stripping away all guilt of original sin. The believer is equipped with a pure heart free of sinful thoughts and motives. Methodist teaching is sometimes summed up in four particular ideas known as the four alls. All need to be saved – the doctrine of original sin. All can be saved – Universal Salvation. All can know they are saved – Assurance. All can be saved completely – Christian perfection. In 1865, an independent Methodist minister William Booth (1829-1912), founded the Salvation Army, which to this day carries out evangelistic and social work across the globe. thou art mine, and I am thine. (The Wesleyan covenant prayer as used in the Book of Offices of the British Methodist Church). Rejection of ordained clergy and sacraments – access to God is available immediately for each individual. Rejection of creeds and all set forms of worship. Quakers are also pacifists and aim to live a life of quiet simplicity; truth and sincerity are vital concepts for them. Their meetings are often conducted in silence until one person, moved by the Holy Spirit, may speak. Quakers are active in social work and education, and have gained much admiration for their dedication and hard work in these areas. There are at least 300,000 Quakers worldwide, with significant numbers in England and the United States. William Penn, a Quaker immigrant to the USA, founded Pennsylvania in 1682. “Now there are diversities of gifts, but the same Spirit. And there are differences of administrations, but the same Lord. And there are diversities of operations, but it is the same God which worketh all in all. But the manifestation of the Spirit is given to every man to profit withal. Estimates vary, but there at least 100 Million Pentecostals worldwide. The movement is especially strong in poorer countries and is probably the fastest growing form of Christianity today. As an example: in 1940, there were around 40,000 Protestants in Guatemala, by 1997 this has risen to 2,075,000, many of whom are Pentecostals (source: adherents.com web site). Speaking in tongues is by no means confined to Pentecostals – in recent times Christians of all denominations have witnessed to this gift. In the Roman Catholic church for example, it forms part of the Charismatic renewal movement. Some Protestant churches have speaking in tongues as a regular part of their worship. We will discuss this issue further in the section ‘Protestantism Today’. Evidence of speaking in tongues is taken as proof (though not the only one) that one has received the Baptism of the Holy Spirit. This is a second Baptism (as distinct from the Baptism one might receive at as an infant, for example). Its function is act as a work of sanctification, drawing a person into a deeper relationship with Christ and enabling them to serve him more effectively. Although there were roots of the Pentecostal movement in the Holiness theology of John Wesley and others, modern Pentecostalism dates from 1901, when a lady named Agnes Ozman (1870-1937) received the gift of speaking in tongues during a prayer meeting. In 1906 at the Azusa Street mission in Los Angeles, a revival broke out and lasted until 1909. Members of the mission all received the gift of speaking in tongues. Christians from around the globe visited and studied the revival and the ideas quickly spread. The influence of Pentecostalism in the modern Christian scene is immense. Some view it as a fourth strand of Christianity, alongside Roman Catholicism, Orthodoxy and Protestantism. Many modern evangelists are Pentecostals and the church has played a significant part in shaping Christianity in recent times. Total Depravity of Man – Man’s nature is totally fallen and needs the grace of God and the work of the Holy Spirit working in him (regeneration) before he can find faith. Unconditional Election – Election is the act of God in choosing an individual. His choice is not based on any foreseen merit in man, but rather comes from his own mercy. Limited Atonement – Christ’s death was effective in removing only the sins of those chosen by him (The ‘Elect’) and not for all mankind. This is also known as Particular Redemption. Irresistible Grace – The call of the Holy Spirit in bringing a person to conversion cannot be frustrated. God’s grace, given freely, always results in salvation. Perseverance of the Saints – Those who are chosen by God, will continue in faith until the end. Those who fall away will not have had true faith in the beginning. Q. What is your only comfort in life and death ? A. That I am not my own, but belong with body and soul, both in life and in death, to my faithful Saviour Jesus Christ. He has fully paid for all my sins with His precious blood, and has set me free from all the power of the devil. He also preserves me in such a way that without the will of my heavenly Father not a hair can fall from my head; indeed, all things must work together for my salvation. Therefore, by His Holy Spirit He also assures me of eternal life and makes me heartily willing and ready from now on to live for Him. Q. Why are you called a Christian ? A. Because I am a member of Christ by faith and thus share in His anointing, so that I may as prophet confess His Name, as priest present myself a living sacrifice of thankfulness to Him, and as king fight with a free and good conscience against sin and the devil in this life, and hereafter reign with Him eternally over all creatures. Also of importance within Presbyerianism is the Westminster Confession of Faith, devised in 1646, which is widely used, especially within the Church of Scotland, whose identity was shaped by John Knox, who led the Protestant Reformation in Scotland.